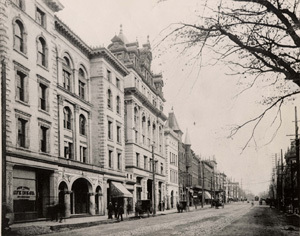 View of Tryon Street in Charlotte at the beginning of the Twentieth Century. Mecklenburg County is located in the southwest region of North Carolina with Charlotte its largest city. It is one of the fastest growing counties in the United States and has a full-fledged GIS system with GIS staff in a number of departments who are involved in analysis, database design, and application development. In 2001, the Mapping/GIS Division of the county began the process of scanning and digitally archiving its entire set of full-size Mylar aerial photography, using a scanner that accommodates maps and aerial photographs up to 36 inches wide. Aerial photography from county archives and selected maps of local historical significance from the Public Library of Charlotte and Mecklenburg County have been scanned. The aerial photography currently dates back to 1966. Maps from the archival collection of the library's Carolina Room date back to the 19th century and showcase the elaborate illustrations and painstaking work created by mapmakers of another era. Andy Goretti, Mapping Project manager, initiated the Historical Mapping Project. "Scanning the maps will preserve them for the future," he says. "History buffs will be able to view the maps, and developers and engineers can access aerial photography for their purposes." The project has received complete support of Kurt Olmsted, manager, Mecklenburg County Land Records. In September 2002, the county decided to make this huge archive, which grows larger every day, available to the public through the Internet. 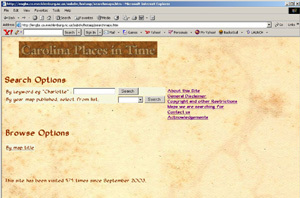 The Web site, which was originally developed using Active Server Pages (ASP) and HTML, uses maps that were scanned and processed and can be viewed in JPEG or MrSID format. In addition, a geodatabase was developed for the maps. In November 2002 the county decided to add its collection of aerial photography to the Web site (engbs.co.mecklenburg.nc.us/subdiv/histasp/historicmaps.htm) and redevelop it using ArcIMS. The county has georeferenced aerial imagery dating back to 1997, and the county has published these layers along with its parcel layer to show developmental growth. The aerial images can be searched by index number or by parcel number and owner. 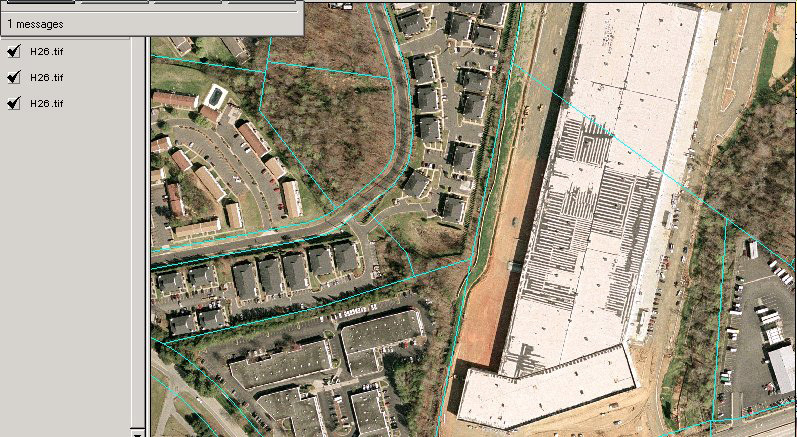 The interactive mapping/GIS functionality of ArcIMS has been used for overlaying aerial images from different years. Other layers, including the most current parcel layer, can also be turned on. The user can zoom/pan to a specific area depending on the search criteria. The county has georeferenced imagery for the years 1997, 1999, 2001, and 2002, and is in the process of getting a set for 2003. 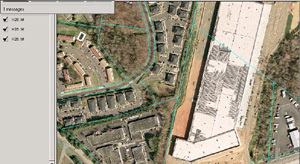 Mecklenburg County also has a vast collection of nongeoreferenced aerial images, which have been scanned and processed. These have been added to the site in MrSID and JPEG format like the other historic maps, but in the future the county is planning to georeference these images using ArcGIS software. The nongeoreferenced aerials on Mylar would be scanned into the ArcMap application of ArcEditor, rubber-sheeted using existing coordinates, and available later in digital format just like the newer aerial images. The Mylar aerial photography dates back to 1966. The information for this site was displayed at the GIS Day function on November 20, 2002, in Charlotte and received a great deal of interest from the general publicmany people showed interest in donating historic maps. Mecklenburg County will probably be one of the few local government organizations in the United States to host this kind of information on the Internet. The Historic Maps Web site search page. Local historical societies have already expressed an interest in seeing more maps on the site and offered to bring their maps in for scanning and sharing. "This has been a fun project for me," says Beverly Lawing, land records specialist, who has helped in scanning the maps and building a database. "I've lived in Charlotte for many years and have enjoyed learning more of its history through contacts with people from the library and historical societies. I'm looking forward to seeing what else we can do together." The Web site is great resource for online research for historians, cartographers, and the general public interested in the history of the region. 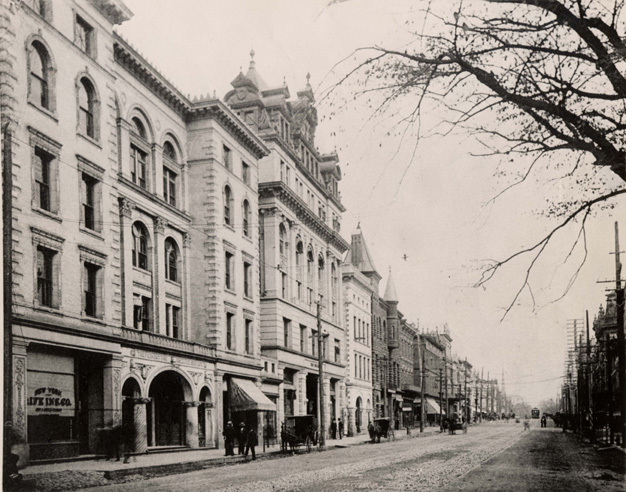 "The vision of the project is exactly in keeping with the highest standards of public preservation," says Cameron Holtz, executive director of Historic Charlotte, Inc. "We are making this information available to the widest possible audience and providing a valuable and unique service." For more information, contact Chaula Jain, programmer analyst, Mecklenburg County (tel. : 704-432-0910, e-mail: jaincm@co.mecklenburg.nc.us), or Beverly Lawing, land records specialist (tel. : 704-432-6007, e-mail: lawinba@co.mecklenburg.nc.us), or visit engbs.co.mecklenburg.nc.us/subdiv/histasp/historicmaps.htm.